RAINBOWS AND BROWNIES FLY WITH PETER PAN. 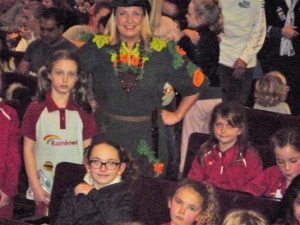 Several units of Girlguiding members travelled to Cowes recently to see the Cowes Amateur Operatic & Dramatic Society’s production of Peter Pan. 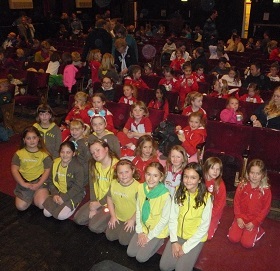 Girls and their leaders from 11th Newport Rainbows, 4th Shanklin Brownies and Rainbows and Brownies from Niton helped pack Trinity Theatre for the production. Everyone was able to join in with the usual pantomime banter and this presentation of JM Barrie’s well-known story was quick paced and very colourful with some surprizes along the way. 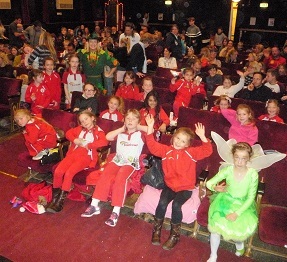 Rachel Dangerfield as Peter Pan and Nancy Tillman as Tinkerbell met with the Girlguiding members during the interval- an added excitement for all those attending. This year’s Cowes Amateur Operatic & Dramatic Society’s production of Peter Pan ran over the first weekend of December and there will be more performances on 8th,9th and 10th December.